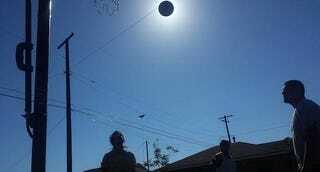 I know this picture looks like the Moon is passing perfectly between the Earth and the Sun. And I know it seems like the people in the picture are trying to look at the eclipse. But this picture taken by Reddit user MDPPatrick is not of a solar eclipse. It's just a perfectly timed snap of a basketball shot. Pretty fantastic, right? Apparently this photo of a basketball game was taken with a Galaxy S4 in 'sport' mode. Not too shabby. Not too shabby at all.